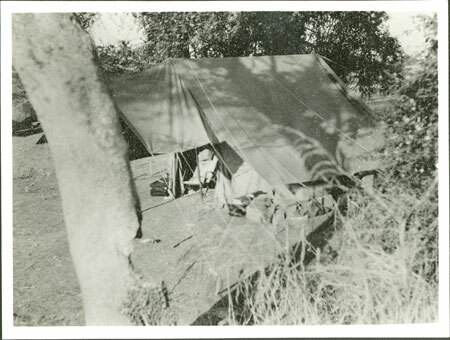 The canvas tent used by Evans-Pritchard during his Nuer fieldwork placed under a tree for shade. A chair sits in the doorway with boxes of various provisions stored under the tent-flaps. The location is probably at a village site, possibly in the Bahr-el-Ghazal region, and therefore possibly during Evans-Pritchard's first field trip in 1930. Note on print reverse ms pencil - "31/7 59 "
Morton, Chris. "Evans-Pritchard's tent in Nuerland" Southern Sudan Project (in development). 03 Jan. 2006. Pitt Rivers Museum. <http://southernsudan.prm.ox.ac.uk/details/1998.346.59.2/>.